Home » Our Doctors » Morgan Grove, O.D. Dr. John Rush and Dr. Nicole Rush would like to officially welcome Dr. Morgan Grove to our office! Dr. Morgan Grove joined our team in June of this year. She is a born and raised Oregonian, she grew up in Myrtle Point. 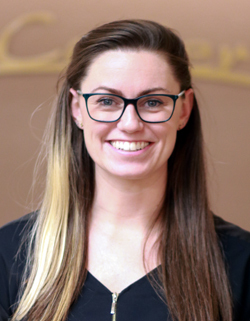 Dr. Morgan Grove graduated in 2012 from the University of Oregon with a degree in biology and then completed her Optometry degree from Pacific University School of Optometry in May 2016. Dr. Morgan Grove is accepting patients on Monday’s and Friday’s. Please call or stop by to make an appointment with her!